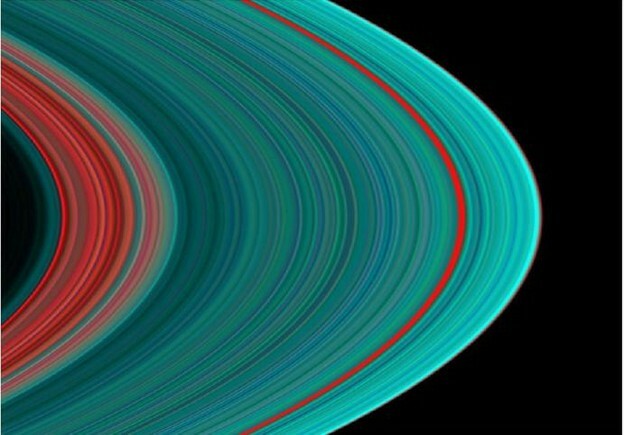 A false-color image of Saturn's A Ring, taken by the Cassini Orbiter using an Ultraviolet Imaging Spectrograph. Dear Reader, we calm the waves that are particles that are waves that are rolling through matter quantum and gathered now near this word sou, the re being of bodies, the earth unre able. Do we feign reflection? Say textual decomposition is no mere figure of natural process. Say natural processes are in fact figures too. Even the monstrous wordlessness we abode by here, no feedback, gaping maw. Just zone, its permeable and moving boundary. The book is buried and we cannot read a thing. The sea beside us. Secret motions of branches, forest language, imperfect tendrils ersl ess. Photo by Susan M. Schultz (Tinfish Editor's Blog) from Decomp (Coach House Books, 2103) by Stephen Collis/Jordan Scott. I threw the book into the dark garden. The account begun mid-ocean, in a storm. A page from my visual tesseract poem that I made after hearing from Bhanu Kapil that she threw her book into her garden. You piece it together. What gets communicated in the soil. We are nesting in these books. A worm finds its way through fibre, indifferent to the letter. Even though the worm may be indifferent to the letter, the letter is not indifferent to the worm. That is one distinction between worm language and human language. Yes, there is worm language, the wiggly trails made by a worm’s movement. My friend mIEKAL aND of Dreamtime Village, a permaculture, art, and media community in the Driftless Bioregion of southwest Wisconsin, makes visual poems out of worm language and other unexpected treasures. The grooves in firewood. Purported alien codexes. Untranslated hieroglyphs. mIEKAL aND’s wormwriting, courtesy of mIEKAL aND. Is the difference between human language and the Earth’s eco-languages the contextual mode of communication? Does the Earth, as in other physical systems in the multiverse, communicate in languages that cannot be accessed by ordinary means? Are some forms of poetry unreadable languages of physical systems, of physics itself, operating as a technology outside of our usual scales of perception in the same manner as telescopes or microscopes? Like worm language, is human language a trail from our human movements, and, if so, how could we move to make more alphabets? Here I am thinking of space travel again. In the future, when astronaut-poets go to outer space to plant their sound poems in the icy rings of Saturn, might they also construct a poetic language modeled on the fleeting wakes of jet fuel trailing their rocketships? The ship docked, and I found my home in a grid system: the damp wooden stool in the bath, a slice of bread with cheese on it, and so on. All my life, I’ve been trying to adhere to the surface of your city, your three grey rectangles split into four parts: a red dot, the axis rotated seventy six degrees, and so on. But then I threw the book into the grid. It was a wet grid. The snow wet the book then froze it like a passive sun. These notes are directed towards the region I wanted to perceive but could not. Notes for a schizophrene night, a schizophrene day, a rapid sketch. The book before writing, arcing once more through the crisp dark air. And the line the book makes is an axis, a hunk of electromagnetic fur torn from the side of something still living and thrown, like a wire, threaded, a spark towards the grass. A line for someone on their first voyage, a non-contemporary subject, the woman or even the man, the person with an articulate gender, a flux where the body always is: who asks what’s forbidden, what’s expected. In the annular zone. In the airport. On the earth. Students in one of Derek Beaulieu’s classes at the Alberta College of Art and Design responded to Stephen Collis and Jordan Scott’s Decomp via sound art. Many are compiled here at the Coach House Books website. Bhanu Kapil’s blog, Was Jack Kerouac A Punjabi?